What Is the Purpose of a Dental Restoration? When a tooth is fully intact it’s incredibly strong. However, if it develops a large cavity or a fracture, it’s no longer strong enough to reliably function without breaking. The chewing forces that teeth are subjected to every day are incredibly high. Sometimes the damage to a tooth is relatively small and can be fixed with a simple filling. But when the damage is more extensive a heavy-duty treatment is necessary to restore the tooth’s strength. Three options are an inlay, onlay, or crown. What’s the Difference Between an Inlay, Onlay and Crown? Inlay – Similar to a filling but made of a stronger material. Inlays are used instead of a filling when a tooth has a particularly large cavity and has subsequently had a lot of its structure removed. This option conserves the most amount of tooth structure. Onlay – Sometimes called a three-quarter crown, this restoration covers the cusps, or four corners, of a back tooth but doesn’t extend all the way to the gumline. Crown – Also referred to as a “cap,” this restoration covers the entire tooth. 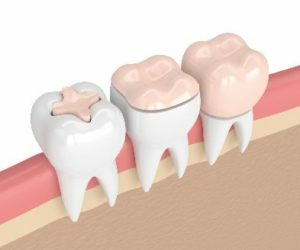 This option is generally used when a tooth is severely damaged and conserves the least amount of tooth structure. All three options can be made with materials such porcelain, gold, or zirconia, which are all very strong. These materials can withstand strong chewing forces and therefore last for many years. If you suspect that you have a cavity or fracture, the first step is to schedule an appointment with your cosmetic dentist in State College. They can assess your situation and recommend the appropriate treatment. Now that you know a bit more about these treatments, you’ll be able to ask the right questions and make the informed choice that’s best for you! Dr. Donald Marks and Dr. John Martin provide general, cosmetic and periodontal services in their practice. They know the importance of conservative treatment and always strive to do minimally invasive procedures. If you think you might have a cavity or fracture and have any questions, they can be reached via their website or at (814) 234-0329.
by: Dr. Donald Marks at March 19, 2018 .